Welcome to The Curtis Company, Inc. The Curtis Company provides full service industrial shelving for clients all over the world. 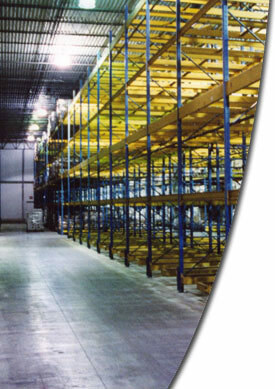 We design, manufacture, rebuild, install, move, and sell warehouse racking systems for warehouses of all sizes and configurations. If your warehouse is in need of organization, simplification, and more efficient management of space and time, pallet storage is the answer, and we can help you get started. If you�re looking to buy a racking system, please browse our Equipment page, where you can find used pallet racks, new pallet racks, and more. We can also help you with the Installation of pallet racks, and offer Consulting to companies looking to make the most of their money. We can also buy your used warehouse equipment, so if you�d like to switch your material handling system, we might be able to help you liquidate. Look at our Liquidation page for more information, or contact us to see if we�re interested. Curtis Racking has been in business since 1987, and we are located in Greenville, South Carolina. Our staff includes design engineers, operators, certified welders, installers, fabricators, and sales associates-all of who share a common goal of customer satisfaction. With years of experience, our staff�s expertise and professionalism has won over many valued customers, including big names such as Michelin, US Foods, Sysco, Dannon, and Bi-Lo. In today's tough economy, efficient management and storage of materials can mean the difference between failure, survival, and thriving. Our expertise in storage and retrieval systems, our familiarity with the material handling industry, and our ability to save you money by offering a mix of new and pre-owned equipment make us a valuable partner to have on board. To learn more about the services and products we can offer you, please read our Company Profile. If you have any other questions, you might try our FAQ. Give us a call us at (864) 947-7401 and let's talk about your company's industrial shelving needs. Or e-mail us at .